Blogging is my dream job, but it can also be a black hole of never ending tasks. When I started my blog three years ago, I struggled with staying on top everything I had to do. Worst of all, I found myself missing great opportunities to post about holidays and other special events because I wasn’t organized. I knew my disorganized blogging strategy (or really lack thereof) wasn’t working and something had to change so I started using an editorial calendar. It’s been an absolute life saver, which is why I wanted to share the love and created a free printable one for you too! My editorial calendar is basically a schedule of future blogging posts and tasks I need to complete. I use it as a guide to figure out what I want to post and when those posts will be published. Holidays and special events no longer get the chance to sneak up on me because everything’s already planned out. Best of all, I never feel intimidated by a blank screen or like I have writer’s block because I have a plan in place. My calendar also helps me space out my content. 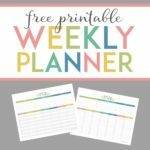 I write about various topics like decluttering and organization, family life, blogging, and I offer lots of free printables. Seeing a month (or an entire year!) at a glance can help me evaluate how I’m spacing my posts. Instead of publishing twenty decluttering or blogging posts in a row, I can sprinkle my content evenly throughout the month or year. One of my favorite ways to evaluate how evenly my content is spread out is by color coding everything. I give each category a specific color so I can easily see if I have too many posts of one category scheduled at one time. An editorial calendar also helps me work more efficiently because I’m able to batch tasks. Bloggers wear many hats. From writing posts to photography, photo editing, and managing social media, it can all get a little overwhelming. However, batching tasks and doing similar things for different posts all at once ultimately saves me a lot of time. Every month I pull the curtain back on my blog and share my blogging traffic and income reports. It’s nerve wracking and awkward (I was raised that it’s not polite to talk about money in public. Eek! ), but checking my analytics and tracking my stats and earnings each month has been a great reminder of what I’m working for and how far I’ve come. This information is available on my various accounts online, but I like to see the information in front of me in black and white all at one time. I also like having a record of what happened in different months so I can better gauge what is and isn’t working. That way, I can tweak or get rid of the bad stuff and keep the good. There are many different types of editorial calendars. The key to using one isn’t necessarily finding the one perfect tool as much as it is finding the perfect tool for you. 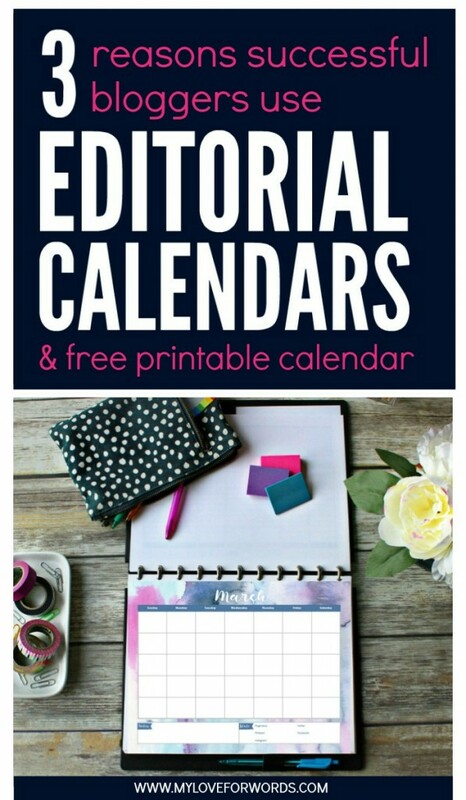 I’m a paper girl through and through so my editorial calendar is on paper in my blog planner. I tend to use pencil on my calendar because life happens, and I have yet to have a month go according to plan. Some people prefer to have everything on their computers or phones, which make programs like Co-Schedule, Google calendar, and Trello ideal. I’m sure there are lots of other electronic options, but these are three I have experience with. They all have pros and cons (like Google calendar and Trello being free and Coschedule being in WordPress), but all three enable bloggers to organize and plan their post ideas and schedules. My editorial calendar has really been a game changer and sanity saver more times than I can count. Things always seem to run a little smoother when there’s a plan in place… even if I don’t actually stick to it. I hope it helps you too! Thanks for the tips and the printables. I’m in month #6 of blogging and even though I have ideas jotted down for each month, I’m still finding myself scrambling before my post date. Need to get better about this, esp. when working on holidays 2-3 months out. You’re right that blogging in a never ending hole of To Dos! Visiting from From Dream to Reality party. My pleasure, Maria! I wish I could go paperless, but I seem to do my best thinking with a pen in hand for some reason.